Place one of the pastry sheets on top of the other and cut into squares. Place the top layer of squares onto one baking sheet and the second layer of squares onto a different baking sheet. Sprinkle one of the trays of pastry with the icing sugar, then cover with baking parchment. Brush the egg yolk on the pastry on the other tray and sprinkle with the white sugar. 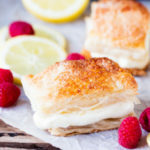 Place the tray with the pastries that have the egg wash on, on top of the other tray – so the pastries on the bottom tray (with the icing sugar on) will stay flat and a bit squashed. Place in the oven and cook for 15-20 minutes - until golden brown. Take the top tray out of the oven, and let the bottom tray cook for a further 5 minutes, then take out of oven and leave to cool. Once cool, use a metal spatula to remove from the trays. Place the cream cheese into a bowl and whisk to loosen it up. Add in the lemon juice and icing sugar and whisk again to combine. Stir through the lemon zest, then spoon the mix into a piping bag with a large plain nozzle. Pipe the lemon mixture onto the flat squares of pastry (the ones that had the icing sugar on). Then top with the squares of the puffed up pastry. Place in the refrigerator for an hour, then serve. These lemon puffs can be placed in a sealed container and stored in the refrigerator for up to a day.